“If you never listen to the call of the Omen birds, no amount of charms will make your work prosper”. And he adds, “These omen birds are all my son-in-laws; Ketupong, Bejampong, Embuas, Pangkas, Beragai, Papau, and Nendak”. Those are the words of Sengalang Burong, the most powerful deity in traditional Iban faith. 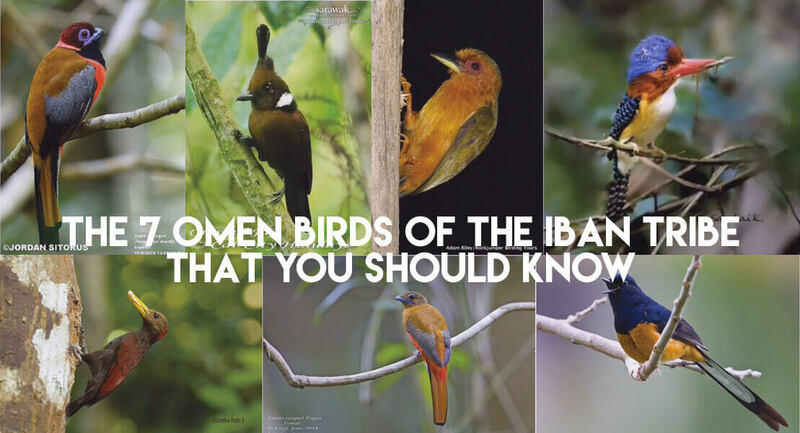 Whether you choose to believe it or not, these ancient tradition of respecting the calls of the Omen birds have made the Iban tribe to prosper, expand and thrive to become one of the most populous ethnic in the island of Borneo. When it comes to waging war, headhunting, paddy harvesting, or even building a new “rumah panjai”, the Iban believes that upon seeing or hearing these Omen birds, it is a potential warning signs given from the deity, in order for them to be extra vigilant and cautious. On the contrary, it could also signify good luck and positive energy. It all depends on which Omen birds that gives out the call. Fast forward to the present time, there isn’t much awareness among the younger Iban generations regarding this almost forgotten heritage. Still, it stays as among one of the most important aspect of Iban culture other than Ngepan, Tuak, Ngajat and so on. Looks small but aggressive with human. When heard during paddy harvesting season, it’s a sign of bad omen: Bad things will happen to the owner’s paddy field. Can present with either good or bad omen, depending on the accompanying sound of its’ brother. When heard alone, it’s a good omen: Very good harvest, paddy will be plentiful. When heard before Bejampung, it’s a bad omen: The person hearing it will soon face hardship alongside his/her family. In Iban culture, Bejampung is very keen sighted (mata lansik) and sharp hearing (pending lansik). Often called by Shaman (Lemambang) to assist in ritual. If it enters a house, a bad sign that the house will be engulfed by fire. If it is found at “Umai Bukit” (Hill Paddy Field), a good sign that the field will be cleansed with ease (umai deka angus ditunu). A sub-species of Woodpecker (Burung Belatuk / Kutuk). Bad omen when heard during harvesting (ngetau): The harvested paddy will not sustain for a long time (deka rua diempa). If heard during headhunting (Ngayau), it shows that the killing of enemies might not be affective (pala munsuh enda ulih pumpung). Similarly if Ketupong is seen at a young paddy field (Umai Temuda), it means that the harvest is going to be bad: Not a good location for paddy planting.